Two items caught my attention at the food store the other day. Both made me pause and scratch my head with a bit of puzzlement. The first being a bag of pumpkin flavored yogurt covered pretzels and the second, a box of pumpkin spice Cheerios. Now since my wildest imagination can't entertain the pretzel concoction, I will leave thoughts on that item up to you! But as for the Cheerios... when I think of pumpkin and spice, I think of dessert, not a bowl of cereal. Don't get me wrong, I love a spiced pumpkin latte and a slice of sweet pumpkin bread; but for some reason, the flavor of Thanksgiving in a cold bowl of cereal wasn't coming together in my mind. What comes together in my mind with the words pumpkin & spice, is a slice of pumpkin pie and a fork. Yup... no bowl, no spoon, no breakfast thoughts in my mind. The flavor of the season is Pumpkin Pie. In fact, McCormick's label on their spice container reads: "Pumpkin Pie Spice". 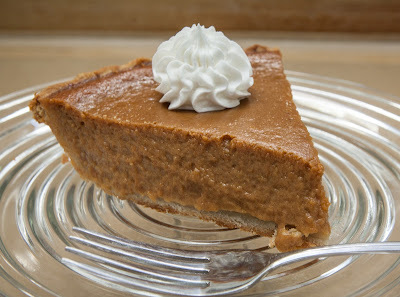 Call me old-fashion but I'll be serving pumpkin pie for desert at my Thanksgiving table, on a plate and with a fork. Any milk on my table will be for coffee, not a cereal bowl. The poor pumpkin pie, it seems to have lost it's famed solo act for the holiday. Fear not though... at Haegele's the stage remains set for dessert with Thanksgiving's traditional star, "bringing down the house" in all its reviews! Move over pretzels... it's Pumpkin Pie time for sure!